You could search for the five best history books, but then you get into all sorts of discussions about Herodotus and Gibbon and von Ranke. 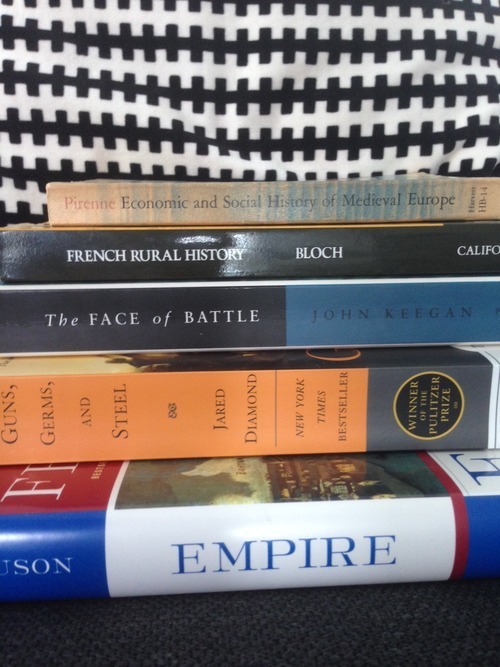 Instead, these are the most useful history books. They cover a wide range of places, a long period of time, and, most importantly, teach you how to do very clever history. 1. Empire by Niall Ferguson: The enfant terrible of imperial history, Ferguson takes you worldwide through four hundred years of world history. And is a prime example of revisionist history. 2. Guns, Germs, And Steel by Jared Diamond: All of human history and how societies work. No better example of big idea history. 3. The Face Of Battle by John Keegan: You can’t understand history without conflict, so here’s the military book. A pioneering work in understanding the everyman. 4. Economic And Social History Of Medieval Europe by Henri Pirenne: Still controversial eighty years on, this is how you think about history differently and systematically. Along the way it takes us back to late antiquity and the original “clash of civilizations” theory. 5. French Rural History by Marc Bloch: A genius book that digs through the the French countryside for a thousand years and shows how to uncover change over la longue durée.